Kaptajns Cottage blev udviklet i 1890'erne af Crescent Beach Land Company som en sommer komme væk. Siden da huset er blevet grundigt renoveret og winterized som en året rundt bopæl. Det er nu udstyret med en stor, spise-in gourmet køkken, et Bose hjemmebiograf, en spisestue / gaming værelse, og en computer område. En stor renovering færdiggjort i 2007 tilføjet en overdimensioneret to bil garage, en master suite med bruser, et øverste dæk med et varmt karbad, et pool / trofæ værelse med et otte fods Connelly poolbord og en kælder med hjemme gym, herunder en universel maskine, en tredemølle og frie vægte. Kaptajnens Cottage er ideelt beliggende kun 66 trin - Jeg counted'em - væk fra den fineste strand i miles omkreds. Crescent Beach er omhyggeligt manicured hver morgen ved crack af daggry. Det har en tømmerflåde, en livredder, og "The Stand", der serverer morgenmad og frokost hver dag. Der er et sted at starte små både. Og det hele er en let gåtur i byen har alle de ammenities af en klassisk New England strand by: musling skure, is og kaffe butikker, antikviteter, gave butikker, biograf, pizzeriaer og vanding huller. Kaptajnens Cottage er unikt egnet til underholdende. Der er en gas-grill på den tropiske tema front veranda, Jimmy Buffet ville være stolt af, og spisestue åbner til verandaen gennem en åbning i den våde bar til spisning. Der er service til selskaber på op til tyve. Kaptajnens Cottage kommer fuldt udstyret med små både, cykler, og alle de redskaber din familie bliver nødt til at få mest muligt ud af dit ophold på stranden! Fuld badeværelser beliggende på andet niveau. Halvdelen bad ligger på første niveau. Fit my Family to a "T"
First let me explain that this July Beach vacation was a Christmas gift to my two sisters and their respective families. The first week my youngest sister was there with her two children and their families which included a two month old and 2 and 4 year old girls. The second week was my middle sister with her two children and their significant others which included 11 and 17 year old boys. The Captain's Cottage fit both families perfectly. Plenty of room inside with bedrooms accommodating everyone. The Master Suite made perfect getaway for me when I needed some alone time. The two boys loved staying in the crow's nest bedroom. We ate on the spacious porch which views of the ocean for breakfast, lunch and dinner. The little ones loved the kiddie pools on the porch that were provided when we were not at the beach. They collected and painted rocks and shells and played in the sand for hours. The older ones spent most of the time in the water or sunning on the raft at Crescent Beach. All days for 2 weeks were spent at Crescent Beach which is groomed every morning and is quiet and uncrowded. We took advantage of the paddle boards and all the beach equipment that were provided at the Cottage. We played billiards and poker at night and watched movies in the Media Room. The hot tub was enjoyed by all the adults at night under the stars. Our hosts Captain Rick and his daughter Jenna were outstanding in communication and helpfulness. The location was perfect and we enjoyed the Children's Museum in the town of Niantic along with Old Lyme Day with the carnival, vendors and fireworks (which we viewed from the upper deck), Crescent Beach Day and the concerts at McCook Park Beach. It is only 20 minutes from Mohegan Sun so my sisters and I spent a morning there at the casino. I highly recommend the Captain's Cottage - so much so we are doing it again next year!!!!! Thank you so much for the kind words as Captain’s Cottage continues to evolve, and looking forward to your future visits! Cheers! This house was spectacular. Rick was amazing thank you so much for letting us rent your house for my special occasion. Steps from the beach, breakfast, stocked with towels unbelievabley spacious. My 4 bridesmaids and I stayed in the house the night before the wedding and had a blast relaxing in the hot tub and listening to music as the waves crashed against the shore. The Captins corners was ideal for my hair dresser, makeup artist and getting dressed. Pictures don't do this house justice. We'll most certainly be back! Amazing time! Great location. Loved the front porch! Captain's cottage was such a great place to spend time with our family. The front porch was perfect for everyone and had a great view of the beach. Crescent beach was perfect, and only a few steps away. The community was so quiet, especially for August. The house was large enough to accommodate our whole family. Loved it. Very close to the beach but the house is in need of work! Disappointed that the house was listed as a 5 bedroom house , there were only 4 bedrooms. They are counting a tiny room in the unfinished attic as a bedroom. Therefore, we were short on bedrooms for our entire family. In addition, there were mouse droppings in the kitchen. The upstairs tub leaked and the master bedroom, left a lot to be desired as for one, the headboard was a leather material that had deteriorated and little pieces would flake off on to you. Despite it, the house was in a good location and had a very nice porch to sit and enjoy the breeze from the sound. Huh? 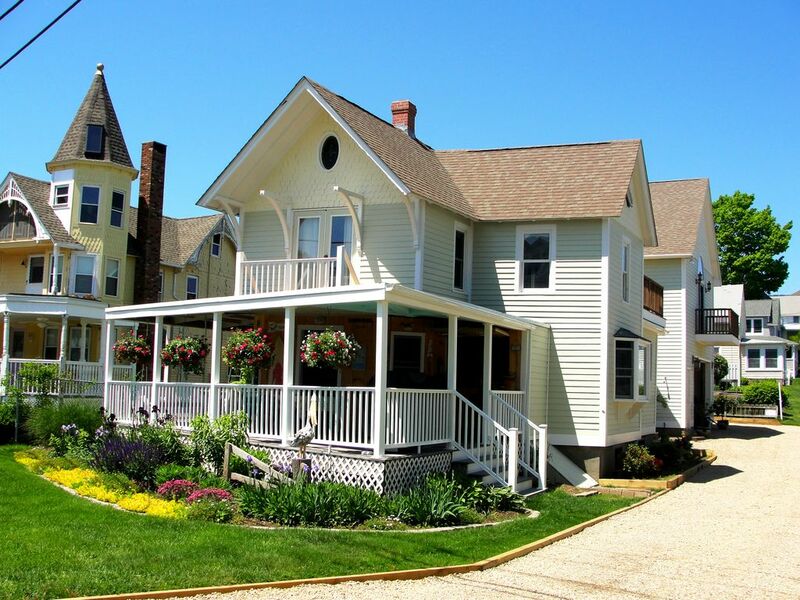 Captain's Cottage stands by the accuracy of its descriptions, and will continue to provide a premium product. This house is fabulous! So much room and the front porch is so relaxing. We had such a great time celebrating our parents 80th birthdays. Captain Rick's daughter was great. She was so attentive in making sure everything was ready before our arrival. I would highly recommend renting this home. It was more than I expected. Thank you Captain Rick and Jenna. Thanks for the kind words, Karen! Glad you all had a great time, and hope to see you again soon!